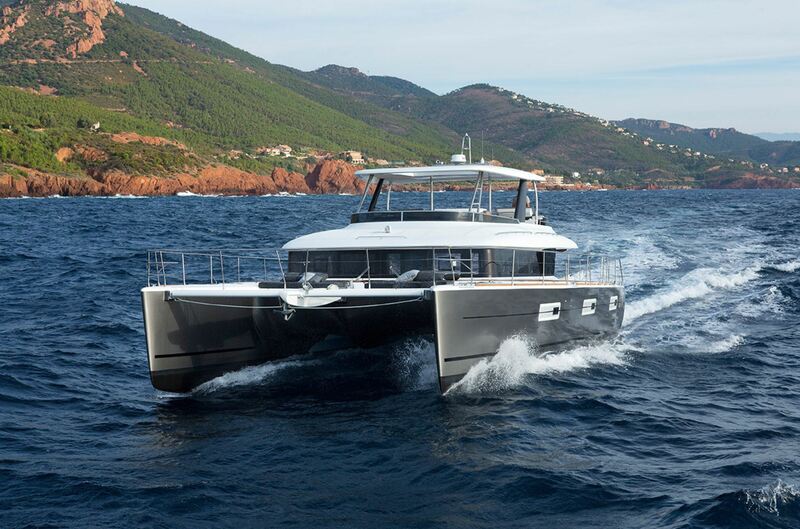 Built in 2018, 19.5m/64ft luxury motor catamaran LONG MONDAY from Lagoon is built from carbon composite and provides excellent stability and a shallow draft to get close to beaches within secluded bays. The interior styling comes from the shipyard, who chose a warm and modern colour scheme with rosy-coloured Alpi oak panelling, white walls and furnishings in white and grey. The accommodation sleeps up to eight guests and four cabins, with a crew of two for expert service. Along the stern of each hull there is a stairway connecting up to the main deck aft, where a sofa lines the stern and beneath the flybridge overhang there is a starboard formal dining area to seat eight and a bar to port, placed close to the door to the main deck aft for excellent service inside and out. A hydraulic swim platform is used to store the tender and provides easy access into and out of the water. A raised sunbed can be found on the starboard aft side, and walkways lead around to the foredeck where there are two plush sunbeds and two net trampolines on the bow for sunbathing. The flybridge above places the helm controls in the aft starboard corner, leaving plenty of room for seating and alfresco dining beneath the hardtop, which has an automated fold back roof to expose guests to the sunshine or the stars. The flybridge forward has a sunbed where guests can rest after a meal and take in the panoramic views. The guest and crew accommodation is placed in the port and starboard hulls respectively, leaving the central section for the shared social areas. The helm controls are placed forward with the galley to port and an L-shaped sofa and coffee table to starboard, with the glass sliding doors to the aft providing ease of flow between areas, great views and additional natural light. Twin Volvo D4-300 engines producing 300 HP each allow for a top speed of 18 knots and a cruising speed of 14 knots. The accommodation sleeps up to 8 guests over 4 en-suite cabins: 1 Master suite, 2 double cabins and 1 bunk cabin. ~ The Master suite is placed in the starboard hull amidships and aft and has plenty of room for a queen-sized bed, wardrobes, a day bed and aft en-suite bathroom with an enclosed toilet, two sinks and a shower. Access to the cockpit directly from the Master suite is granted via an aft stairway through the bathroom. ~ The double cabins are placed forward in the starboard hull and aft in the port hull respectively, and both have a wardrobe and en-suite bathroom containing a toilet, sink and shower. ~ The bunk cabin is placed amidships in the port hull and is ideal for children or staff. Inside, there is a wardrobe an en-suite bathroom containing a toilet, sink and shower. ~ The crew of 2 are accommodated in the bow of the port hull. We do have available further amenity, owner and price information for the 19.15m (62' 10") yacht LONG MONDAY, so please enquire for more information.